Must See! Strong design Art Deco platinum brooch diamonds and sapphires: Description by Adin Antique Jewelry. This Art Deco platinum brooch is gifted with a dispersive allure by the 72 old European and single brilliant cut diamonds pave set in a millegrain pierced geometrical design. 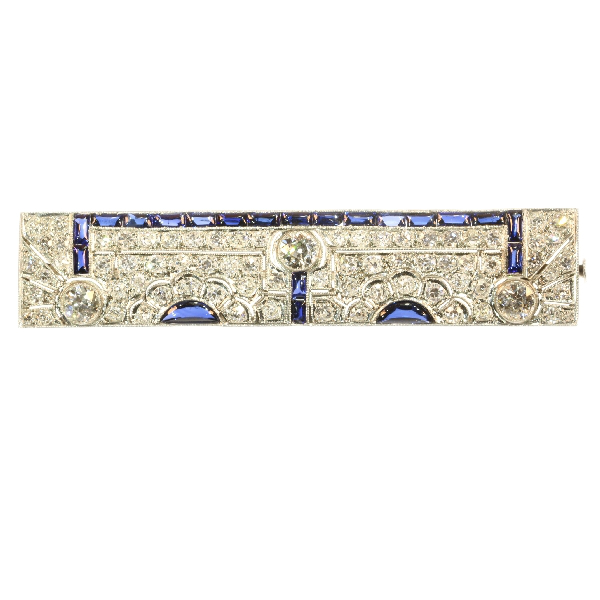 A row of 19 rectangular cabochon sapphires connect three grand old European cut diamonds while two peeking half-moon cabochon cut sapphires surrounded by diamond-encrusted flower petals give the final feminine touch to this marvellous antique jewel. Diamonds: Three old European cut diamonds with a total estimated weight of approx. 1.20 crt. 72 old European cut and single brilliant cut diamonds (also called 8/8) with a total estimated weight of approx. 3.24 crt. Total diamond weight: approx. 4.44 crt. Precious stones: 21 cabochon polished sapphires . We did not check if the sapphires are lab produced or not as this information has no influence on the value of this jewel. Natural sapphires and lab produced sapphires were both used in this era, rather more for their effect than for their intrinsic value.